I use breed specific, high quality, non- superwash yarns sourced and spun in the UK for dyeing. A large majority of these wools are British or rare breeds and are all dyed with natural dyes. 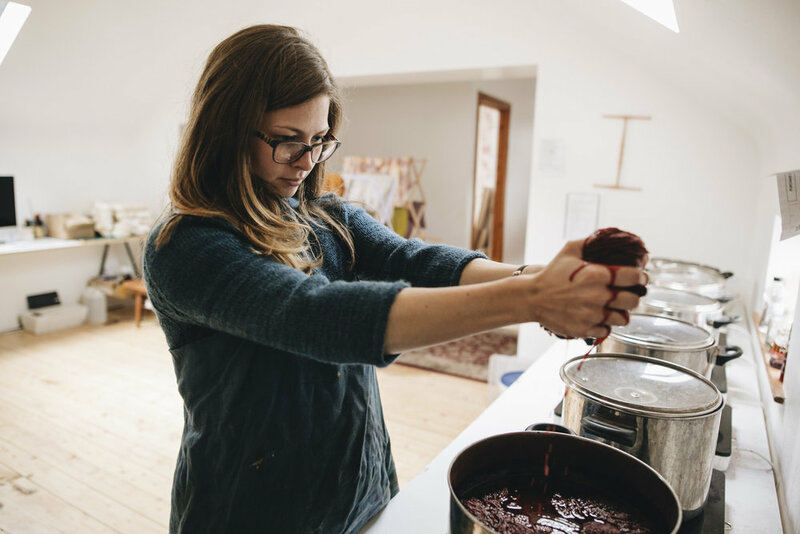 Many of my natural dyes are foraged from my local area or home grown in the garden. Sometimes I like to use kitchen waste to dye too. My colour inspiration comes mainly from walks in the quiet Irish landscape, stories of epic adventures or sometimes old books and poetry. I started spinning when I was at Art College in London, inspired by a good friend who was already spinning, I then took up the craft myself. I bought my wheel via eBay and not having had much experience with spinning wheels before, I wasn’t sure what to look for. I ended up choosing a rather unique Frank Herring wheel that was hand made in Dorset. Once I collected my wheel I couldn’t stop spinning! I learnt about different fibres, sheep breeds and techniques, honing my craft. Occasionally in the shop I carry a small range of handspun fibres. Because spinning is so labour intensive I only create handspun skeins when I have time. However, if you have a project you’d like a specific skein for, feel free to get in touch. All goods are mailed in clear, compostable bags to minimise the environmental impact of posting, and are wrapped in recycled tissue paper. Just pop the mailing bag in the compost heap or in the ground and it will compost within 6-24 months! I regularly travel throughout Northern Ireland to do demonstrations and workshops in schools, museums and historic buildings. Feel free to get in touch via the contact page for more information and pricing or for any other creative project you have in mind. I get excited about woolly wool, natural colours and the outdoors! I am an avid knitter, dyer and spinner and a lot of my time revolves around these activities. In my ‘normal’ life I am an architectural photographer, and in 2017 I decided that I wanted to spend more creative time off-screen. Since then I have been making more with my hands and I get great satisfaction from this. I love unusual or interesting sheep breeds, and I’m an advocate for local farm yarn! As you can imagine natural dyes can sometimes give surprising results, which is part of the fun for me! Everything is a balance between temperature, water pH, fibre type, dyestuff amount etc so I enjoy experimenting with all of these elements when dyeing. I generally use Alum as a mordant, which is a type of metal salt- this allows the colour from the dye bath to ‘stick’ to the fibre. This goes on the stovetop to simmer, and when the fibre has cooled it moves over to the dye bath. When I finish dyeing I rinse my fibre, and then soak it in Eucalan. Then all the lovely colours get hung up to dry! 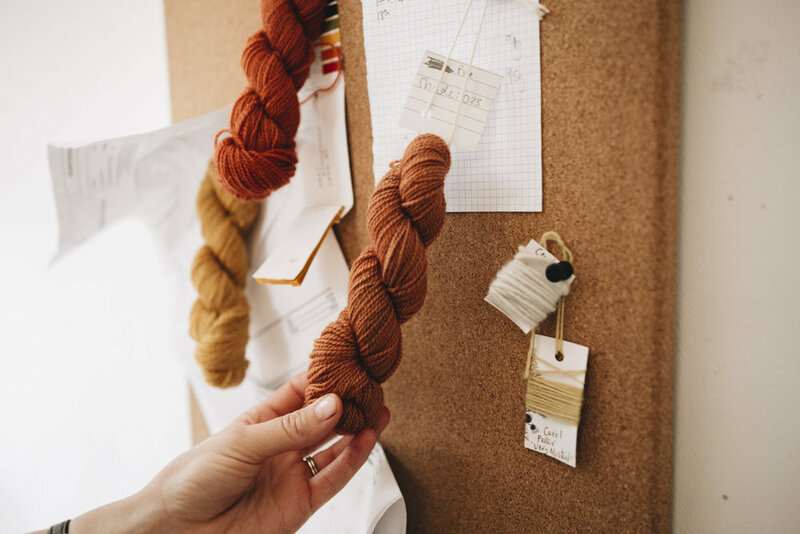 Remember, even though most colours are dyed in a dye lot, each skein has it's own variations and characteristics due to the natural dyeing process. Because of this, when knitting a garment it is best to alternate between skeins to avoid colour pooling. Eventually, all natural dyes will fade- chemical dyed articles will also fade! This is one of the reasons I love them- they will inherit a memory and history of their own. 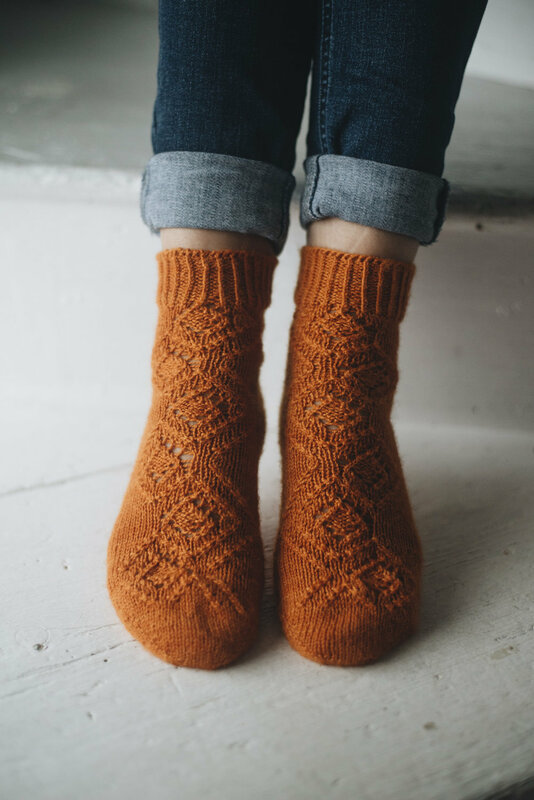 To ensure the long life of your naturally dyed yarn/ garment, store out of sunlight when not being worn and wash with a gentle no rinse, ph neutral wool wash in cold - lukewarm water. Dry flat. It’s possible that because I dye on non- super wash yarns that the dye may bleed a little when first washed- please bear this in mind when first rinsing your item. It is always recommended swatching and blocking before doing colour work. With indigo, it’s quite normal for the dye to ‘crock’ off a little when knitting with it as pressure is applied- this is the normal wearing process of indigo. You can put a little dash of white vinegar into the rinsing bath to combat this when you are ready to swatch and again when you block. Remember, all computer monitors are different so there may be a small difference in the colour accuracy between monitors! I try to be as accurate as possible when taking and editing photographs so any difference should be very minimal.